is available as an 800A (50KA fault rated) or a 400A (40KA fault rated) busbar for main and secondary distribution boards. 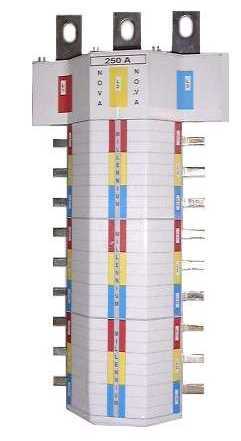 It will accommodate most MCCB's, switches, direct connections, switch fuses and neutral links without adaptors. The 400A and 800A busbars are ASTA certified. is a 250A busbar. It will accommodate MCB's, MCCB's, surge suppressors, earth leakage and other devices at nominal 18 mm, 25 mm, 30 mm & 35 mm outgoing terminal centres. The 250A Nova is ASTA certified. All Millennium units are fully insulated and totally encapsulated in a composite proprietary matrix filler giving a fault free unit without nuts, bolts, rivets or other loose or fault provoking components. Millennium is safer than conventional systems. The Millennium System is ASTA certified and cheaper and faster to install than conventional systems. Millennium saves space and is fully protected from atmospheric conditions. Maintenance free - no joints, nuts or bolts. The MillenniuM System accommodates - MCCB's, MCB's, switches, fused switches & direct connections. Accommodates most major OEM's MCCB's, MCB's and other outgoing devices. No adaptors are needed for most manufacturers devices. 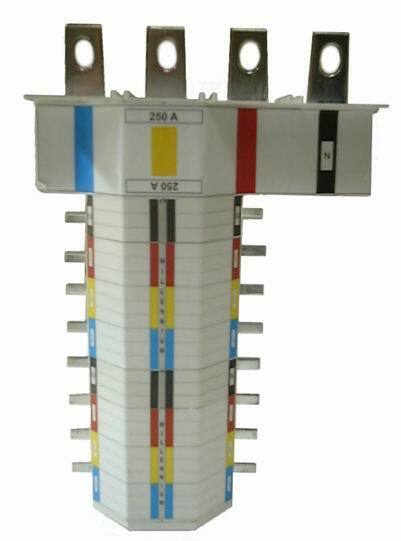 250A, 400A, 800A busbars with terminal centres at industry standards. Other centres & mixed configurations can be supplied on request.